A doctorate in leadership. A lifetime of impact. Realize your fullest potential as an expert in collaborative, compassionate and effective leadership. At the nation's first doctoral program in Leadership Studies, you'll embark on an immersive and innovative experience, enjoying close engagement and mentorship from faculty along the way. Focus on one of four specialties: Higher Education Leadership, Nonprofit and Philanthropic Leadership, Organizational Leadership and Consulting, or Teaching, Learning and Leadership—or determine your own specialty. You'll complete a core curriculum and international study experience, and you'll pursue a customized track that suits the unique ways you seek to make a difference in the world. You'll emerge empowered as a researcher, scholar, educator and practitioner. And you'll be poised to make significant contributions to the field of Leadership Studies while addressing some of our communities' most pressing needs. Whether your degree takes you into the entrepreneurial realm, into academics, into nonprofits or any other place in need of your skills, you'll find fulfillment, significance and adventure. 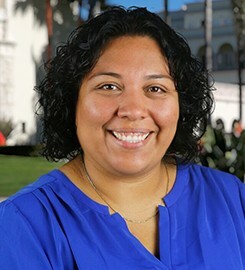 Ariela choose the PhD in Leadership Studies at USD because it provides a transformative experience. "In the program, I knew would grow in understanding, character, confidence, and overall ability to serve collegiate students and the world we all inhabit. You will be pushed intellectually, supported in your educational pursuits, and encouraged to find ways to align with your values within your current and future practice as a researcher and/or educator." Our grads are leaders, advocates, idealists and changemakers. Where could your doctorate degree in leadership studies take you? Our alumni are professors, researchers, educators, policymakers, school leaders, university administrators, consultants, nonprofit directors and business leaders. Have a look at our student outcomes and the incredible span of alumni dissertation topics.